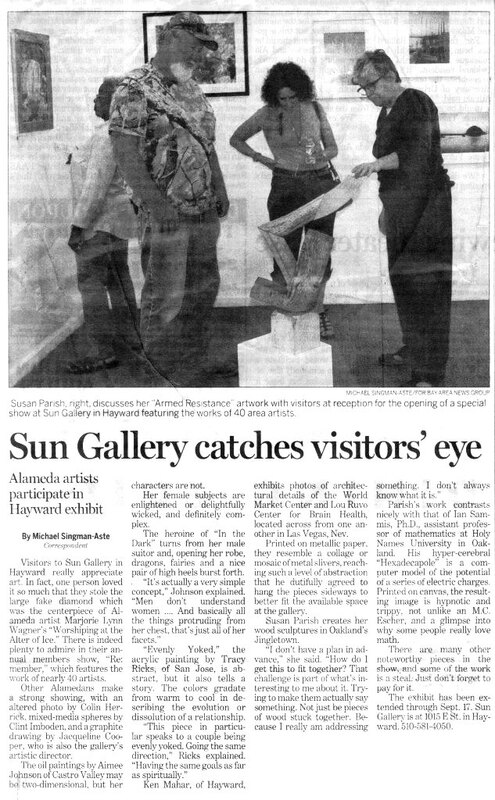 This article appeared on August 26, 2011 in the Alameda Journal. Connie Rux, editor. This entry was posted on Friday, August 26th, 2011 at 9:21 am	and is filed under Artists. You can follow any responses to this entry through the RSS 2.0 feed. You can leave a response, or trackback from your own site. Thank you very much for the mention, and taking time out of your busy schedule to send me the link! It was a delight to meet you. I look forward to the next time! Great article! Thank you so much for featuring me and including the photo of my art! Thank you very much for sending me the link to this! It was lovely meeting you, and I hope we’ll meet again at future shows. It is evident that you put lots of thought and care into each of your excellent weekly articles. Giving credit to artists who otherwise get little recognition is a huge contribution. Good news! A replacement has arrived for the missing faux diamond. Maybe some stronger glue? On to the next show at Rhythmix- K Gallery. D’Arcy is very flexible and I need that because of the nature of my work. Michael, you are a charming colorful character and an important asset to the Alameda/Bay Area art scene. Alameda wouldn’t be the same without you. Keep it up! It was a pleasure to meet you the day of the event at San Gallery. The Alameda JournaI should feel fortunate to have you on their staff. I appreciated the mention about my work, every little bit of exposure helps in these difficult times. Maybe I will see you at the “Evening of Art” on Sept. 23rd at Hayward City Hall Rotunda, which benefits the childrens art programs at Sun Gallery. Also,I would like to invite you to the 14th Annual Art & Olive Fest on Oct. 2nd, held at Canada College in Redwood City. 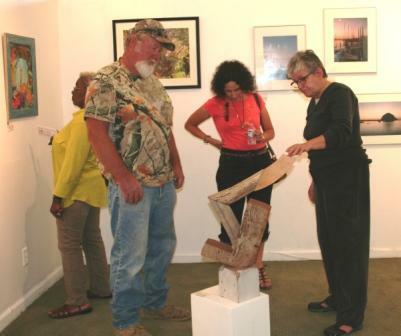 It is a very nice venue for artists to display and sell their work.